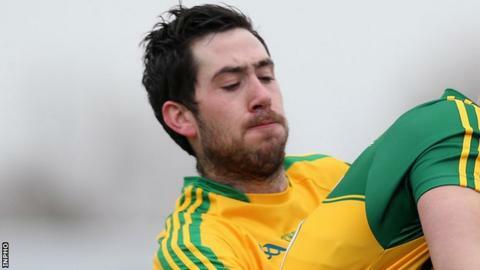 Mark McHugh's involvement with the Donegal squad for this season appears in doubt after it emerged that he is not training with the county panel. Donegal manager Rory Gallagher has confirmed that the Kilcar man is training on his own and did not confirm any return date for the 2012 All Star. "At present he is not in the squad," Gallagher told Donegal Sport Hub. "He is working on his own individual strength and conditioning programme under our supervision," said Gallagher. McHugh was included as part of Gallagher's squad for the McKenna Cup campaign but did not play against Down on Sunday. It is not known whether he will play any part in the county's Football League Division One campaign, which begins on Saturday 30 January. McHugh was part of Donegal's 2012 All-Ireland winning team but opted out of the panel following the 2014 League campaign, heading to America for the summer. His last game for the county was last summer's All-Ireland quarter-final defeat by Mayo. Donegal will face St Mary's at Letterkenny on Sunday in their next McKenna Cup game.